Pirates senior Libby Miller attempts a pass in her team’s victory against Northwest Thursday evening, 9-0. Mohawk senior Evan Throckmorton as he prepares to net his first of two free kick goals in their defeat at the hands of the Pirates, 5-2. On Thursday, Northwest and Wheelersburg faced off in the first leg of their first double header of their SOC II regular season competition. The Lady Pirates were ultimately victorious after starting Thursday’s match off on a slow note, winning by a score of 9-0. 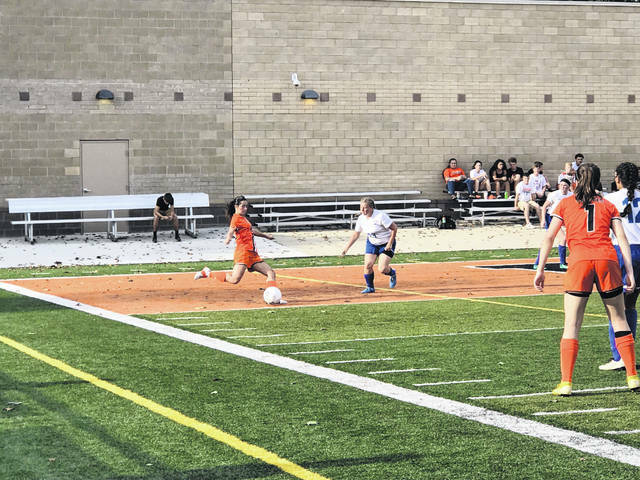 The first goal of the game for Wheelersburg came over halfway through the first half as senior Sophie Hagans netted her first of two goals with 17:04 left in the first half. Just under five minutes of game play later, senior Libby Miller scored her first of two goals in the game with 12:46 left in the first half. With 8:49 left in the first half, Kristin Risner scored her first goal of the game to push Wheelersburg ahead 3-0. The first half scoring wouldn’t stop there, however, as Hagans scored her second goal with 5:08 left in the half, giving her team the 4-0 lead heading into the intermission. The second half would feature more of the same from the Lady Pirates as Miller and Risner each scored another goal to add to their team’s total, and also new scorers Chelsee Steele and Allie Vallance were each able to find the back of the net in their team’s 9-0 victory against the Lady Mohawks. This victory made the 50th straight regular season match in which the Lady Pirates have not been defeated. In a league that never lets up, the SOC II provided fans and family members with yet another incredibly competitive match Thursday evening at Ed Miller stadium. The score does not reflect how close and intense this match was in its entirety. The first goal for the Pirates came in the first ten minutes as senior Cameron Llewellyn found the back of the net, giving his team the 1-0 lead at the 33:47 point in the first half. Wheelersburg freshman Nathan Sylvia joined Llewellyn on the scoreboard for the Pirates after his rebound shot found the back of the net, extending his team’s lead to 2-0. This score would hold until a very competitive second half. Standout player for the Mohawks, Evan Throckmorton, who has had games of six and seven goals respectively for his team at this stage in the season, would not let his team go down without a fight. Throckmorton was awarded a freekick with 35:44 left in the match, a freekick he would turn into results on the scoreboard as he found the back of the net, cutting the Pirates lead in half at 2-1. Just over ten minutes later, Throckmorton was awarded yet another free kick and he once again was able to score with 23:42 left in the match to tie the game for the Mohawks at 2-2. 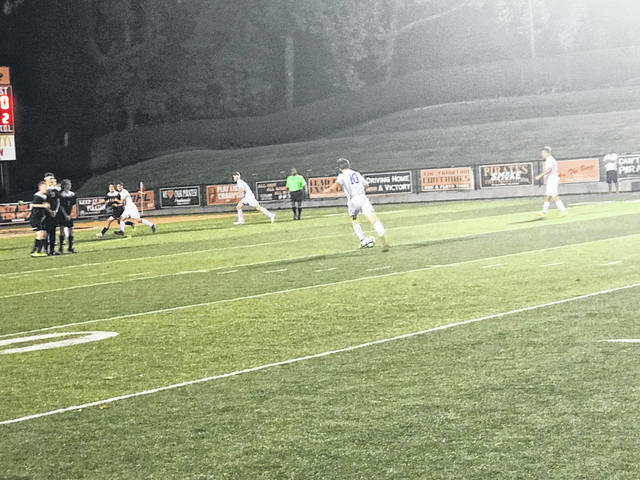 The game would not remain tied for long, however, as Pirates sophomore Carter McCorkle scored with 20:49 left in the match to give his team the lead again at 3-2. Senior Chayden Holbrook scored his first goal and another goal for the Pirates with 13:44 left in the match, before Llewellyn scored his second goal of the game with 5:23 left in the match to give the Pirates the 5-2 victory over Northwest. This win puts the Pirates in a good position in the SOC II race after a tie against Minford last week. The Mohawks will travel to North Adams on Tuesday to face the Green Devils. The Pirates will host the Waverly Tigers next Tuesday in yet another crucial game in the race for the SOC II title. https://www.portsmouth-dailytimes.com/wp-content/uploads/sites/28/2018/09/web1_burgLibby.jpegPirates senior Libby Miller attempts a pass in her team’s victory against Northwest Thursday evening, 9-0.
https://www.portsmouth-dailytimes.com/wp-content/uploads/sites/28/2018/09/web1_evanNW.jpegMohawk senior Evan Throckmorton as he prepares to net his first of two free kick goals in their defeat at the hands of the Pirates, 5-2.